It all started long, long ago in an inner city nightclub where a DJ and a lighting operator were working. Bored after an 8-hour shift, John Wall and Ming Gan started talking about promoting. Neither of them had done it before but they both had a history working in the dance music industry. They figured it was worth a shot and Fuzzy was born. The first Fuzzy party was Tunespotting on 10th August 1996 and they didn’t know what to expect. Lucky for them it was a sold out show, which gave them enough money to fund the next party. A string of successful events at Sublime on Pitt St, Sydney convinced the owners to take Fuzzy on as the club’s full time promoters. Fuzzy helped to make Sublime a clubbing legend, which transformed from a venue to a Friday night at Sydney’s largest club, Home. It was around this time when an assertive door girl, Adelle Robinson, joined forces with Ming (the lighting operator) and John (the DJ) and the Holy Trinity of dance music promotion was complete – all three were essential for a successful event. John, Ming and Adelle’s vision for Fuzzy was to bring the best parties to the people. The three directors still remain at the reigns today. After years of promotion for Sublime and Home, Fuzzy decided to step out on their own with two new brands that quickly revolutionised the Sydney dance scene. In March 2000 Parklife became the first outdoor dance event to be held in Centennial Parklands. Parklife exploded and as it grew it extended its reach beyond Sydney. 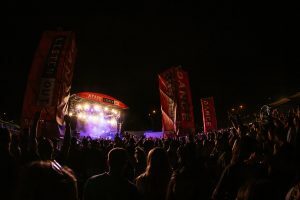 It travelled nationally to 5 capital cities across Australia to a combined crowd of over 100 000 festival goers and has become the iconic festival to kick off the summer festival season. In July 2000 the first Fuzzy Breaks party was held at the Metro. With the help of the Fuzzy Breaks events the breaks scene in Sydney and Australia exploded to such a size that events like Winter Break sold out 5,500 tickets at the Hordern Pavilion. After establishing Parklife in Sydney, Fuzzy decided they should be doing more outdoor dance events and sent a proposal to the Royal Botanic Gardens. To their amazement the Gardens agreed to a New Year’s Day dance party in the Domain to celebrate the beginning of 2002. Field Day has since become the most successful and well-known dance event in Australia, selling out months in advance to crowds of 25,000. Despite initially starting Field Day as an escape from New Year’s Eve, somehow Fuzzy ended up doing events on New Year’s Eve as well! In 2003 and 2004 a few thousand people counted the New Year in at Fuzzy events at Bondi Pavilion. From there Shore Thing was born. Now taking in a huge area looking out to the Pacific Ocean at Bondi Beach, Shore Thing has sold out 15,000 tickets each year so far and is Sydney’s biggest and most popular New Year’s Eve Party. Harbourlife was created soon afterwards in October 2003, when Fuzzy made the most of one of the world’s most exquisite event sites, overlooking the shimmering harbour and stunning Sydney views. Harbourlife continues to sell out every year and is renowned as the quintessential Sydney party experience. In 2013, Fuzzy introduced a new event to the family Listen Out. This boutique and more intimate touring party showcases the top house, electro and hip-hop acts from around the world, to crowds in four major Australian cities. Fuzzy is not only a successful events company, but also tours a large number of DJs and live acts from across the globe for club shows and other festivals in Australia and Asia. Check out who we have toured here. Fuzzy has come a long way since their early small events and continues to push the boundaries with new music genres. The plan for the future is more great parties… good times done properly: It’s what Fuzzy is all about.